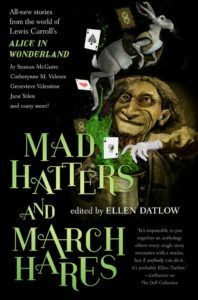 So the night before Conflux, Muse will be hosting myself, Kaaron Warren and Ellen Datlow to talk about the new anthology Ellen’s edited, Mad Hatters and March Hares. Both Kaaren and I have stories in there, and we’ll be doing readings as well as chatting about the influence of the Alice tales … and how easily they might be turned to the purposes of horror. This entry was posted in News and tagged alice in wonderland, angela slatter, Canberra, conflux, ellen datlow, kaaron warren, Mad Hatters and March Hares: New Stories of Alice in Wonderland. Bookmark the permalink.